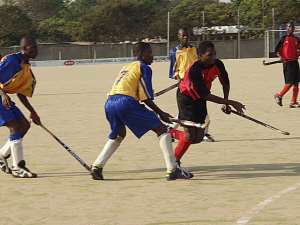 1 December 2004 -- I participated with my country at this years' African Cup for Nations Under21, where Ghana won bronze. South Africa won gold and Egypt had silver. Nigeria was the fourth team. The tournament was held in Cairo in September 2004. In October I participated again with my club; Trustees of SSNIT at this years' African Cup for Club Champions in Abuja in Nigeria. There were six (6) teams from 3 (three) African country namely Ghana, Nigeria, and Egypt. Trustees of SSNIT and Exchequers of Bank of Ghana represented Ghana; Delta Force and Yobe State represented Nigeria and El-Sharkiya and El-Sayadeen represented Egypt. At the end of the tournament, which was an “all play all” affair, El-Sharkiya deservedly won gold after beating all 5 teams to clinch the title. Delta Force came second with Yobe State settling for a third spot. Unfortunately my team came fifth. Back home in Ghana my club won the local league and lost out on goal difference to CEPS in a special Top 6 tournament.